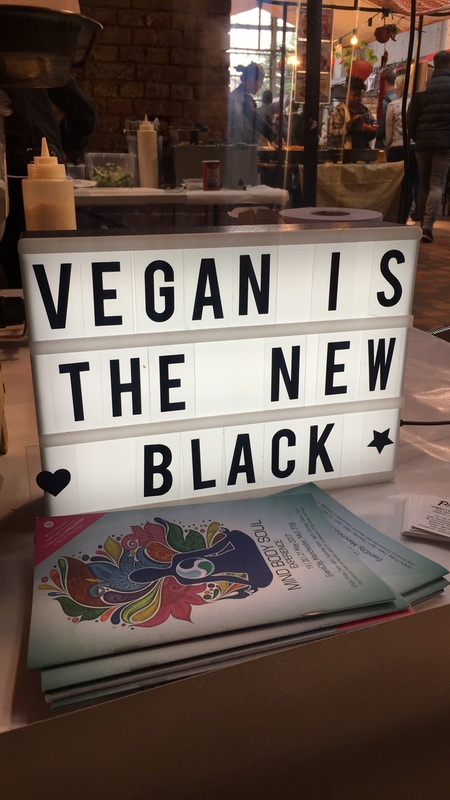 Review: Vegan Cheese Fingers and burgers @ Brick Lane - Daisy Chains. Hello all! This is yet another one of my extremely back dated pieces. I need to get into the habit of actually posting everything on time because I think this one is from all the way back in May. To be honest, I've been feeling quite demotivated recently hence the lag in my posting. Anyways one afternoon me and my friends decided to head over to Brick Lane Market as my friend wanted a bagel. On the other hand I wanted to try a burger from this vegan stall that I had seen on instagram. We circulated the place 1-3 time only to discover that we had kept missing the stall although it was right there in front of us. 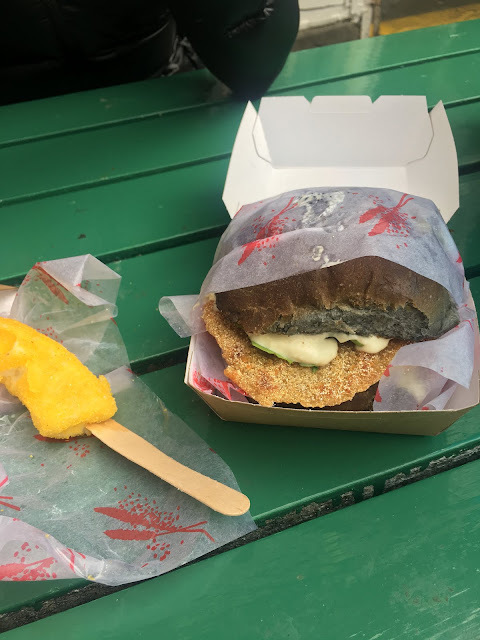 I decided on trying the Schnitzel style burger which was made of seitan sandwiched between a charcoal bun and a cheese finger from Pomodoro E Baslico. 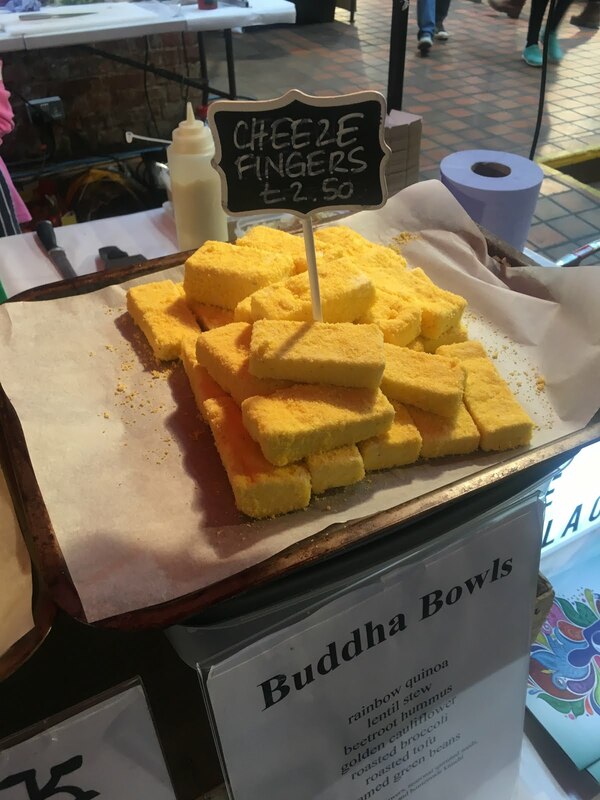 My initial thought was that the cheese finger was far too overpriced for what it was. If I recall correctly it cost £2.50 for a single cheese finger. On the other hand, the Charcoal Schnitzel burger was well worth it. I've never had real Schnitzel, so I couldn't possibly tell how close to the original thing this is but it sure as hell was super filling and tasty. I had to literally walk off my food baby after having this one. The burger was not dry and the sauce which I assumed was vegan 'mayonaise' was not sickly tasting. I say this as I know some vegan mayonnaises taste exactly like salad cream which honestly makes me feel quite sick. I'd happily have the burger again, but they have a variety of other burgers on their menu that I want to work my way through before I try this one again. The cheese stick on the other hand I think I will pass on, not because it didn't taste good, but just because I feel like the price is too steep for what it is. What's your favourite vegan street food outlet?